A house design that considers it environment will surely come up lovely. Homes like this will not just look into what the homeowners need but it will also put into consideration the natural environment around it. Some homes will not touch existing rocks or trees to retain the look and save them too. While others try to get their interior design and architecture from the elements around them. This kind of designing is very remarkable for it would create a distinct connection between the owners and its surroundings. Today’s featured house has this kind of design. This house is made into a home with a perfect balance between tradition and modernity, luxury and rigor, and fashion and comfort. 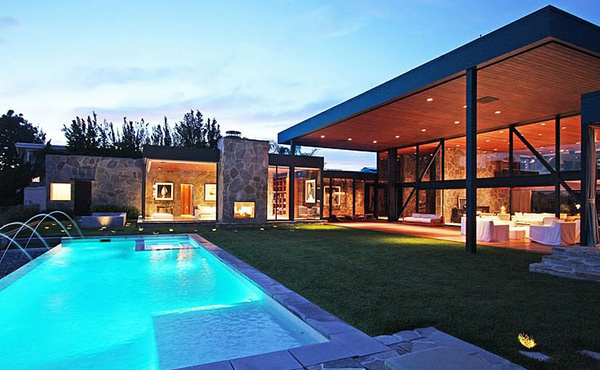 It is called Clinton Residence wresting on the top of the mountains in Beverly Hills, CA. 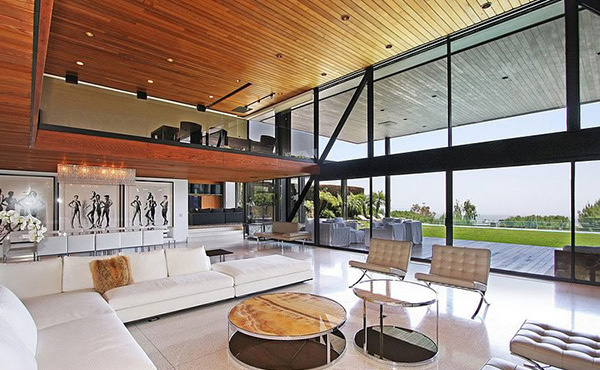 From the house, one can get lovely views of downtown Los Angeles to the east and the Pacific Ocean to the west. The house was originally designed in 1973 by architect Amir Farr but was redesign by Maxime Jacquet and came out even more dashing. The house is situated in the middle of the city among a very natural environment carrying earth tones in the interior. Want to see the house? Scroll down and be ready to admire it! 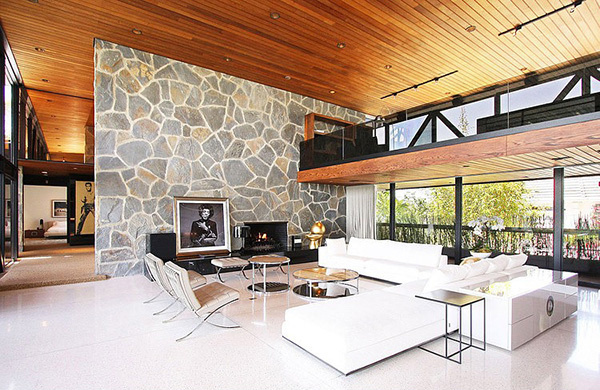 Anyone will be attracted to the stone wall in the interior as it is given emphasis with the white floor, wooden ceilings and slim modern furniture. Observe that the house has many creative artworks that surround it. Even the round glass center tables are lovely accents to the space! 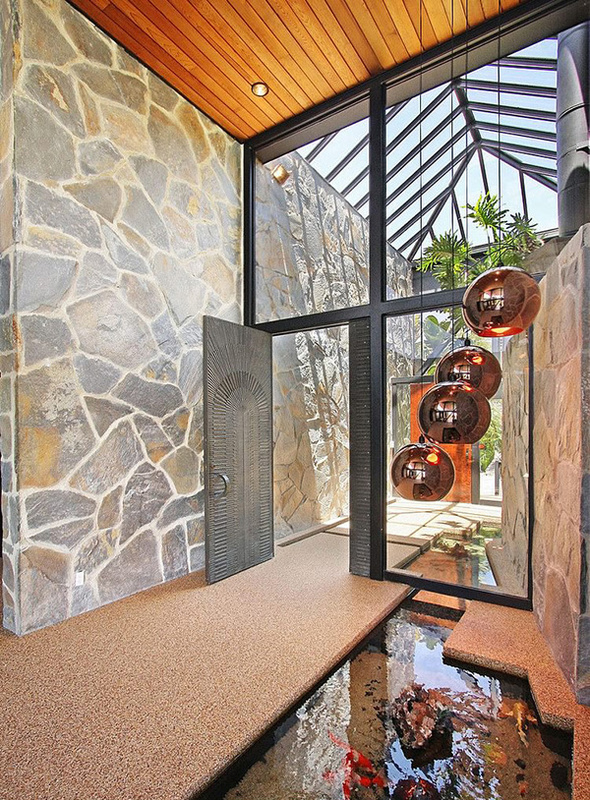 We’d guess this is the foyer of the house where everyone will be welcomes by a stunning door, modern chandelier and some fishes on the water which means good Feng Shui. Stencil styled artworks like this are seen all around the house. 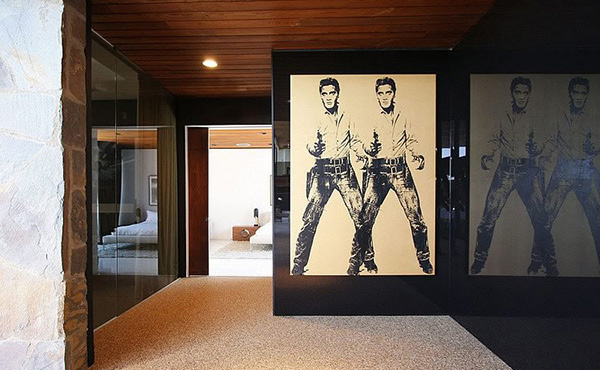 Well, this wall art could shock you but then impress you on your second look. 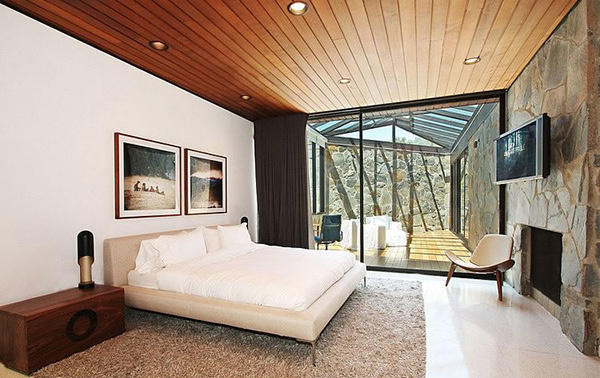 For sure you can spot more artworks here in this very spacious bedroom with glass walls. It also has a tall wall with bookshelf! This bedroom is simple and contemporary in style with a stone fireplace. 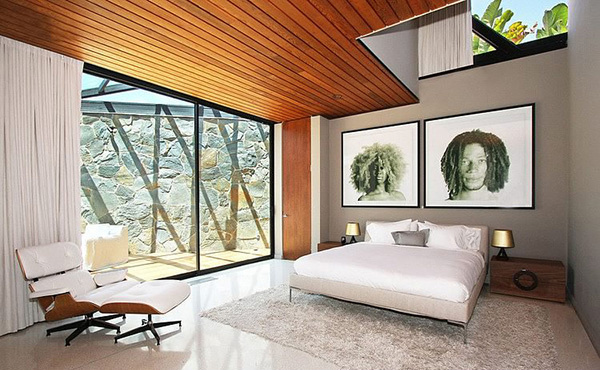 Another bedroom with a skylight on it and some artworks too. The design of each bedrooms was created similar to each other. Even the bathroom did not escape from the portraits! 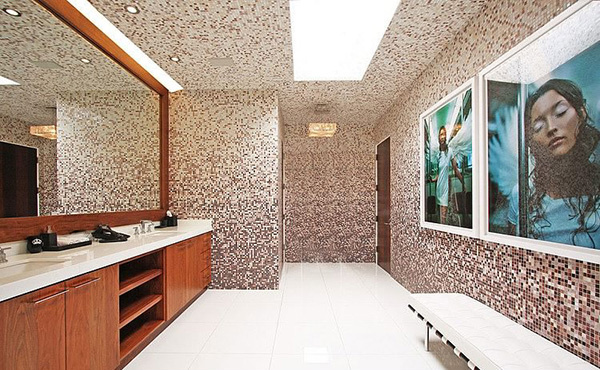 We love how it seemingly mingled with the mosaic tiles on the wall. 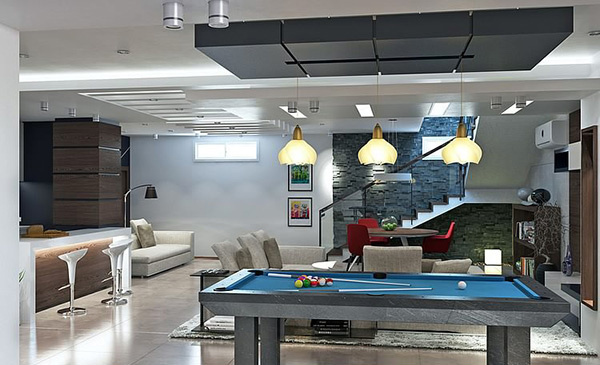 A gaming area for entertainment is allocated for a certain spot of the house where a home bar is also seen. Note that outdoor area that is used as an extended living and dining space. But for sure, you will not miss this pool too which may be unadorned but looks very stunning. A closer look at the outdoor area with wooden decking- what a romantic space! What makes the house look coherent is the use of three important materials namely wood, glass and stone. You can spot pebble stone coated floor and stoned walls. Even the terrace outdoors creates a special connection between the interior and exterior. Well, you will really agree with us that Maxime Jacquet did a great job for this project seen in every detail of the house!